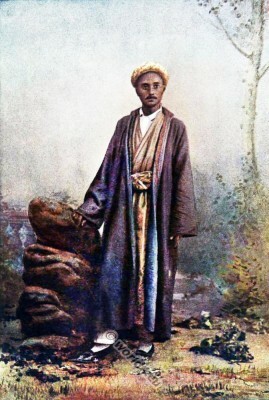 It may perhaps be objected that a Persian is not a native of India, and should therefore have no place in this little volume, but as there are now many Persian families who have permanently settled in this country, and adopted in a measure the dress of their co-religionists, it is thought that an illustration showing their costumes will not be out of place. There is a considerable trade in tea carried on between India and Persia, the larger portion of which is shipped to Bunder Abbas (Gameroon) via Bombay. Tea is the largest item of export between the two countries, being followed by indigo and cotton goods. 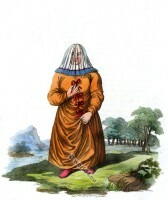 A quantity of Cashmere shawls are also shipped, and also tin and copper sheeting, drugs and spices. Indigo is largely used in Central Asia for the purpose of dyeing cotton and silk, for staining glass, and in the manufacture of blue and white enameled tiles. From it is also made the hair dye which is in very general use among the natives of India, and this accounts for the peculiar blue tinge frequently observed in the bushy black beard of many an ancient Mohamedan. The Persian Gulf is always more or less associated with the idea of piracy and murder, on the subject of which many tales might be told. The following story, however, will suffice as an example. A Bombay merchant, having visited Muscat for the purpose of trade, set out on his return voyage in a native sailing boat, known as a buggalow. The captain of the vessel was a Beluchi, and during the voyage this man formed the notion of plundering the merchant of all he was worth. Having informed the crew of his nefarious scheme, and obtained their promise of assistance, he accordingly butchered the merchant during the night, together with those who would have stood by him. The murderers thereupon took a solemn oath to keep inviolate secrecy, and having transferred the plunder to some date jars, they one and all, nineteen in number, embarked in the long boat and set fire to the buggalow, to hide all traces of their guilt. Six of the men, however, fell victims to the captain’s suspicions, and were cruelly slaughtered; two others, fearful of the fate of their companions, leapt overboard when the boat neared the coast, and made their way to their native town. Asked why they had returned so soon, they replied that their vessel caught fire, and they had thrown themselves into the sea. The British Agent at Muscat having doubts as to the truth of the story, they were arrested, and upon full pardon being promised them, they confessed the whole story. After endless search and trouble, the captain of the burnt vessel was ultimately apprehended, and upon learning that evidence was forthcoming to convict him, he admitted his guilt, and threw himself on the mercy of his captors. The matter of his trial was referred to the Bombay Government, who desired that he might be tried by the native court at Muscat. His Excellency Syed Soweynee ( Imam of Muscat), however, considered it unnecessary to go through that formality, and promptly had the culprit executed off hand. Source: Typical pictures of Indian Natives. By F. M. Coleman, 1897. 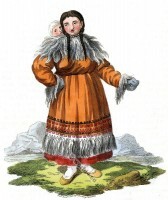 Traditional dress of a female Ostyak. Nala and Damayanti. Indian myth and legend. Ornamental Metal Work from East India. A Woman making stockings. 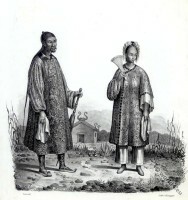 China 1799. A Barabintzian Girl. 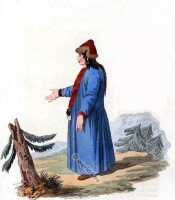 Russian folk dress. This entry was posted in 19th Century, Asia, India, Middle East, Persia and tagged Pictures of Indian Natives, Traditional Arabian costumes, Traditional India costumes on 10/29/13 by world4.